As we celebrate the 100th anniversary of the armistice ending World War One, let’s bring in a writer not primarily known as a “war poet,” Thomas Hardy. Hardy is one of those bridge-poets between the era of the romantic and sometimes sentimental Victorian poets and the Modernists. Though I’m told Hardy never felt at ease in London artistic circles (he was country-born, son of a stone-mason and largely educated through apprenticeships as an architect) his poetry was admired by some of the Modernists. Why might that be? While his language can sometimes seem antique to modern ears, it was his language, the language of a rural 19th century working class Englishman. And while he will write about sentimental subjects, he’ll balance that with a cold eye. The horse-drawn harrowing time of the Breaking of Nations. But what’s that woman doing behind the horse? Hardy grew up in a rural, farming district, as I did, and it may have been natural for him to relate the violence of the Great War to that setting. And I love how he does it here with three spare quatrains: the boustrophedon horse-drawn disk or rake plow that is literally breaking the earth*, in contrast with the prophetic “Breaking of Nations” warning from Jeremiah used for the title. Then there’s smoke rising, not a razed town after an army has swept through it, “only” the burning of invasive weeds. And finally, a mysterious third stanza with a mysterious word: wight. It’s an old word, one of those that came to English with the German Saxons centuries ago. Chaucer knew it, used it in The Canterbury Tales, and as best as I can tell it meant a sort of unimposing person or creature. Sometime later, perhaps after Hardy learned the usage of the word and after this poem was written in 1915**, it’s taken on a supernatural connotation. It’s fairly easy to trace that back to J. R. R. Tolkien’s use of the word in The Fellowship of the Ring written decades after Hardy’s poem. 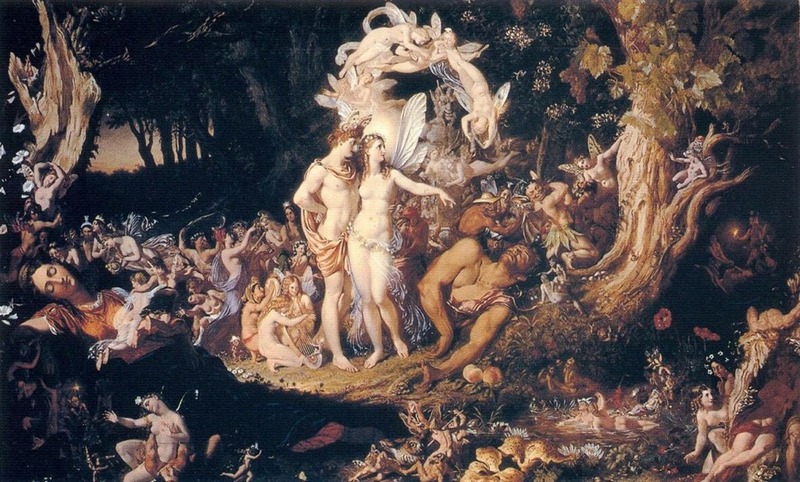 Tolkien was a scholar of the ancestor languages of modern English. Did he know of other usages of the word, or did he simply take a very old word and choose to use it for an undead-spirit slain in battle? So, in this last stanza, what does Hardy mean by his whispering maid and “her wight.” A flirting young couple? Are they whispering merely to shield their romantic bantering from others? Or is it something weirder? Is this a young woman whose man is off to battle, or even one of the battle-dead? Or, as part of Hardy’s theme are they both immortal ever-returning spirits, whispering because you only barely sense them in our time-bound world? I don’t have the detailed historical knowledge to know how depopulated the farming areas of England were by the need for soldiers during WWI. From Edward Thomas’ poem from last month, “Gone, Gone Again” I get the idea that the absence of farming men was noticeable. And it was at least enough of an issue that England formalized an effort to recruit and train women as replacement farm labor. Not just whispering to her boyfriend. 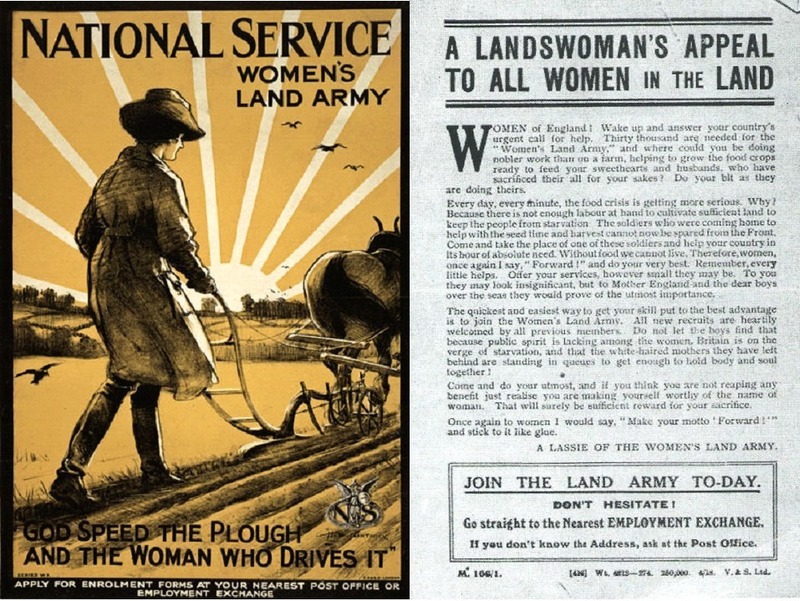 “There’s not enough labour at hand to cultivate sufficient land to keep people from starvation.” Recruitment ads for the Women’s Land Army in England during World War I. Well, I just like it that this is blurred. Do the final two lines give us any clues? Why does Hardy say that “War’s annals will cloud into night?” In early drafts, Hardy wrote “fade,” and “cloud” seems a more peculiar choice. In the context of the 2nd stanza weed-burning, I’m thinking he’s saying they will disappear in a cloud of smoke. Also in context of the 2nd stanza, this would make such war records in some future as valueless as weeds, but smoke/cloud again reiterates that there’s something unsubstantial about the couple. “In the Time of the Breaking of Nations” demonstrates a lot of what I like about short lyric poetry. T. S. Eliot could write a Modernist masterpiece like “The Wasteland” extending to the farthest lengths of lyric expression, 15,000 words—but a poem like this can touch a lot in its 63 words. It may not be apparent due to the instrumentation used, but I might have been subconsciously inspired by Bob Dylan’s repeating chord progression used for his masterful three-short-stanza song “All Along the Watchtower,” which is very much in the same mode as Hardy’s poem. Here is my performance of Hardy’s poem. Use the player below. *Note too, Hardy’s pun on “harrowing.” For another discussion of boustrophedon plowing and time, see this earlier post. Near the end of his life, while visiting a farming museum, my father wanted me and his grandson to know that he’d walked behind a horse-drawn plow. **Though the poem was published in 1916 when Hardy was asked for submissions of poems to support the war effort, one biographer says it may date back to 1870. 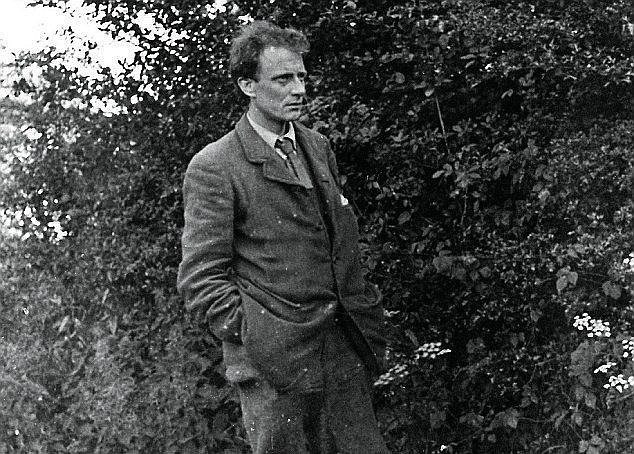 In my roundup of World War One War Poets earlier this week for the upcoming centenary of Armistice Day, I only mentioned Edward Thomas in passing. He shares the military service and the battle-related death of the others, but his writing about the war is different. Though he was working on notes that could lead to poems during his short front-line service, I’m unaware of any Thomas poems that tell of his experiences of battle. Many of his poems instead deal, intentionally, or inherently in their time’s context, with the change in norms that the war brought. A poem like his much loved “Adlestrop,” if read in the context of the war’s coming outbreak, speaks even more intensely of the peace and unnoticed wonder that pauses in the muddle of an unscheduled train delay. “Adlestrop” doesn’t mention the war though, and it’s based on one of Thomas’ journal entries from before the war. On the other hand, a poem like his “Gone, Gone Again” speaks intentionally and masterfully about the changes in his beloved countryside “before the war began turning young men to dung.” His highly condensed “In Memoriam, Easter 1915” is another that intends to mark the war’s changes. If you look at a continuum* from his “In Memoriam” through today’s “The Owl” to “Gone, Gone Again” you can see a journey from a short and moving, though impersonal, elegy/pastoral through “The Owl’s” introduction of a linkage of his own corporal experience to those on the front, and concluding with the even more personal and aching conflation of his own state with his country’s situation in “Gone Gone Again.” For this reason, I’m going to put the audio player gadgets for all three in the post today, so that you can follow Edward Thomas’ journey as he decided as a middle-aged family man to enlist—volunteering for the front-lines, and his eventual death. Here’s “In Memoriam (Easter 1915)” as Thomas begins to weigh the costs of war. And this is today’s new addition, “The Owl.” It’s not important to the poem, but the pendant in me wanted to know what species of owl Thomas heard. England helpfully has fewer species of owl than North America, so it must have been a male tawny owl, as the other candidate, the barn owl, has a screechy call that couldn’t have been cast as melancholy. *I don’t actually know what order that Thomas wrote them, or even if “The Owl” was written before the war, as some particulars of the journey he describes echo the book he wrote about a bicycle tour he took from the suburbs of London to the border of Wales in 1913. But for performance reasons, seeing the three poems as a narrative seemed defensible to me, or at least no more anachronistic as having the artificial tang of Mellotron strings and flutes to stand in again for England in the music. As we enter the week in which we note the ending of World War One a century ago, I want to call attention to some the ways we’ve shown poets wresting with that war in their own time. It’s a longer post, but each one of these pieces presents something different for Armistice Day. I didn’t start out to feature the WWI generation here. I first intended to include more modern poets’ words, but to do so I would have needed to try to negotiate the issue of finding the copyright holders and getting them to respond to requests for permission when I thought I’d located them. That turned out to be frustrating. This left me with the pre-1923 generation, the original Modernists, as the most recent voices I could consistently present. Like many limitations this brought an unexpected return. This generation’s members were the pioneers in the new poetic voice that I had to deal with as a young man and young writer, and to some degree we’re still dealing with them now. Even the basic and incontrovertible truth that the majority of published poetry has been free verse in my lifetime is not some inevitable thing, someone had to suggest and prove its efficacy. And the kind of imagery we take for granted as allowed or desirable in literary poetry? That too is their doing. WWI did not start Modernism. Americans and the French were experimenting with many of its tactics as early as the mid-19th century, and British Modernism was already emerging before 1914. But the events of WWI bent the development of Modernism by their tremendous gravitational pull. Sometimes directly, by poets and artistic allies who were killed, but also by propounding the idea that the established artistic order was incapable of describing the world of the first world war or it’s aftermath. Pre-WWI Modernists writing in English could be straightforward and modest in their poetry. They often valued shorter forms that assumed the elaboration would occur in the minds of readers rather than in endless lines on the page. 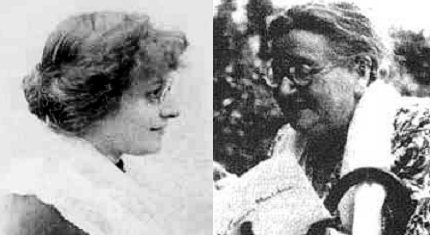 Post-WWI, the longer poem and much more elaborate and opaque imagery came to the forefront, and the form of the irrational became a large part of the reflected world, even for writers outside the movements like Dada and Surrealism that were formed around that. It’s been an adventure here reliving those changes. Some of the Parlando Project’s most popular pieces have come from that WWI moment, and here are the six most popular WWI poems we’ve presented here. 6. Christ and the Soldier. Siegfried Sassoon seems to have been somewhat superseded by his friend Wilfred Owen as the representative British War Poet of the anti-war stripe. Owen may have “benefited” by dying in the war, rather than having the long career that Sassoon had. Sassoon was a highly decorated veteran of the trenches when he started to publicly oppose the war, and this lead to the danger that he could have been charged with treason, and a weird compromise was worked out where he was treated instead as a man suffering from mental illness caused by the war instead of being put up on trial, the kind of outcome that Joseph Heller would have relished writing of decades later. “Christ and the Soldier” is not politically anti-war, but it’s stark, darkly-humorous, and yet serious account struck me from the first time I read it. As WWI poems go, it deserves to be much better known. You probably haven’t heard this one, so use the player below. Still, as a piece of invective, and as a condensed statement of art’s challenges in dealing with monstrous events, I have to hand it to Ezra for his set of words. Pound helped “popularize” the use of phrases from many languages in High-Modernist English language poems, much to the benefit of footnote writers, and in “These Fought” he drops a variation on the same Latin phrase used by Wilfred Owen in Owen’s best-known anti-war poem: “Pro patria, non dulce non et decor” in Pound, “Dulce et decorum est” in Owen. In either case, the Latin phrase, from Roman poet Horace, is about it being sweet and proper to die for one’s country, and neither the veteran Owen or the non-veteran Pound meant to endorse that phrase when they used it. In our 21st century world, large portions of proper Americans would agree with Horace’s original thought, and take umbrage with Pound, or possibly even Owen denying its validity—yes, I could see that being charged against even Owen who gave his life, however sweet or properly. The gadget to hear Pound’s rant about the waste of it all is below. This large American military cemetery engraved Horace’s maxim in 1915. And whether for solidarity, guilt, or respect for duty, many will endorse it still. Some will stand by it with their lives not just a chisel. 4. Trenches St. Eloi. Another poem by a front-line veteran of WWI, one who didn’t survive the war, and a man who was important enough to the founding of English language Modernist poetry that his war death might have alterned post-war Modernism to some degree. T. E. Hulme helped form Pound’s own views on how poetry should “make it new,” and was admired as well by T. S. Eliot, but his own poetry is now little-known because of its sparseness in number and length. Though he was known as a pugnacious talker in person, and was a writer of audacious criticism, his surviving poems have a shocking modesty about them, something I find quite admirable. Though he wrote dispatches to English home-front periodicals during his service (from those I’ve read, they support the English cause) this is his only poem about his experience of the war itself, and it was composed, or rather transcribed, while he was back in England being treated for battle wounds before going back to the front and his death. To hear Hulme’s ode to soldierly persistence, use the player below. 3. The Death of Apollinaire. Speaking of influential casualties of the war, Guillaume Apollinaire, must be right up there. The man coined the names “cubism” and “surrealism” after all, and his verse influenced not only countless French poets, but Americans like E. E. Cummings. The exact cause of Apollinaire’s death is open to attribution. He was still weakened by war wounds when he was struck down by the infamous 1918 influenza epidemic just two days before the end of WWI. 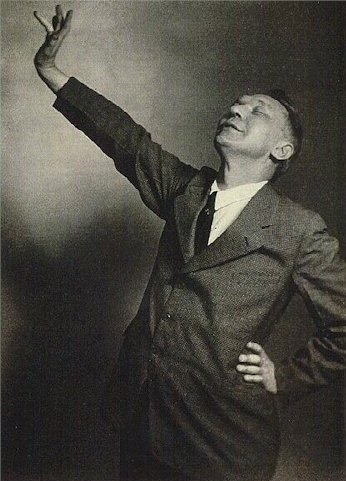 The poem used here is a surprisingly sincere elegy written by a frank shirker of military service, Tristan Tzara, who as a teenager fled the tinderbox of the Balkans where the world war started for neutral Switzerland, where he participated in the invention of Dada at the famous Cabaret Voltaire. Dada had no respect for the pieties of the warring parties, but Tzara’s respect for Apollinaire comes through in my original translation of his poem. Thinking of Hulme and Apollinaire as front-line soldiers in WWI makes me pause and wonder at the differences in my own time. 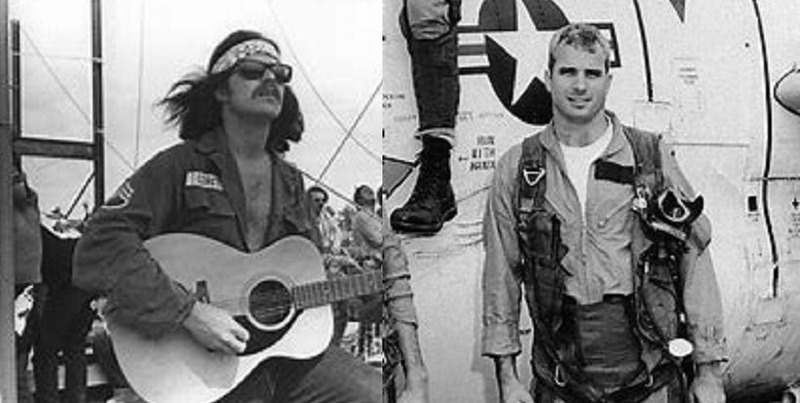 Can you imagine John Lennon and Bob Dylan serving as grunts in Vietnam? Or Damon Albarn and Jay Z being deployed to Iraq? Of course, there are differences in poet/critics and pop-stars however artistic the songwriters are, but still it’s a different world, and Modernist artists both reflected and helped to form it. To hear my performance of my own new translation of Tzara’s poem about Apollinaire’s death in the autumn of victory, use the player gadget below. 2. Grass. Carl Sandburg didn’t serve in WWI. He was a Spanish American War vet however. His personal position on WWI is somewhat hard to figure. He was writing for the stalwartly anti-war IWW under a pseudonym and explicitly supporting there the radical IWW line that the war was the Capitalist class enjoying their profits in a cage match between the working people/cannon fodder of both sides. Yet also during the war he wrote pro-war pieces under his own name, taking the same stance as some other parts of the US left: that the Central powers were evil empires lead by ruthless kings that needed to be defeated by the democracies Britain, France and the U. S. In 1918, Sandburg published “Grass” and attempted to synthesize both sides of Sandburg. “Grass” is sometimes considered a straightforward patriotic poem, a reverent poem about the ultimate sacrifice of veterans, and if read in such a context no one is likely to object. But listen closely. Even though he echoes Whitman’s leaves of grass metaphor, even if you may find it next to John McCrae’s “In Flanders Fields” in some presentation of poems about honored war dead where we might be implored to “Take up our quarrel with the foe!” One might even too-quickly think it’s akin to what Sandburg’s hero Lincoln would say in his Gettysburg Address, that we “cannot forget what they did here.” But, Sandburg’s poem’s point is literally the opposite of Lincoln’s: that we will forget what they did here. How completely true is that forgetfulness as we approach the centenary of the end of WWI? A discussion point. To hear the LYL Band perform Sandburg’s elegy to soldiers graves, use the player below. 1. On the Troop Ship to Gallipoli. These most-popular-here WWI pieces I feature today: it’s a rather downbeat outlook, even Hulme’s piece is not the sort of thing to inspire sacrifice for one’s country. Pound’s rant openly doubts the beliefs of some that did, and is unequivocal on the base motives of those who lead his host country in the war. WWI war poets did write poems that supported the war effort. A personal favorite of mine, Edward Thomas, volunteered and died at the front with a deep belief in the nobility of service that overwhelmed his suspicion of the war’s rationale. 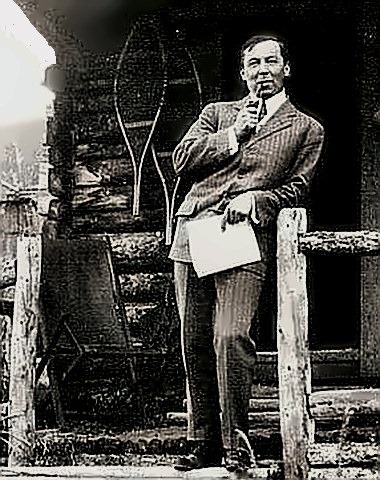 Pete Seeger’s uncle, Alan Seeger, wrote his fatalistic but heroic “I Have a Rendezvous with Death.” Another well-known poem in this mode is British poet Rupert Brooke’s “The Soldier.” If one believes that any active deity must have a dark comic streak, Brooke dying of an infected mosquito bite while steaming to the front lines of one of the most horrific battles of the war could be part of your testimony. Pound once had to explain that when he was critical of Brooke’s poems he was speaking of their old-fashioned prosody, not his character. When I saw this fragment found in Brooke’s journal after his death I saw an opportunity. What if Brooke’s observation of his fellow soldiers on their way to battle could be shaped to express itself in the mode that Modernists like Pound, Hulme, or Sandburg would have used? You can see the edits I made here, and listen to my performance of my setting of it with the player below.